Peridot is the only gemstone born from fire! These gems originated from volcanic eruptions on an island in the Red Sea. They have been found in other volcano’s rocks around the world since then. There have even been Peridots mined from a meteor that fell in Siberia in 1749! These gemstones know how to make an entrance. Due to their association with volcanoes, Hawaiian folklore says that Peridots are the tears of Pele, goddess of the volcano. Peridots have been associated with magical powers throughout history, such as the power to ward off evil spirits and to protect against nightmares. As with many gemstones, Peridots have been frequently utilized in church ceremonies and rituals. The ancient Romans called Peridots the “Evening Emerald.” This was because you could see the sparkling light green color, even in dimly lit rooms. Peridots range in color from a light yellow-green to a rich, medium apple-green. They are quite affordable, particularly in smaller sizes. This makes them a very popular choice for fashion jewelry. Today, most Peridot is mined in Arizona, Myanmar, China, Sri Lanka, and Pakistan. Sardonyx is the alternate birthstone for August. 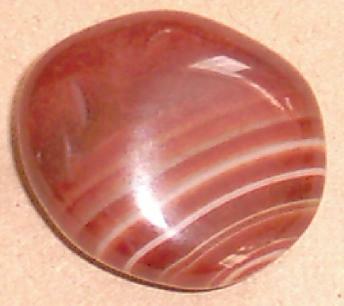 This is the red variant of the stone Onyx, which is black. This stone is an opaque, reddish-brown, and is typically banded with irregular white markings. Sardonyx is usually found in men’s fashion rings, but would be beautifully used in women’s pendants, rings, and earrings, as well.